Please select item(s) to delete. You have made changes. Do you want to discard your changes? This app processes “data related to health” pursuant to the General Data Protection Regulation. In order to properly guarantee processing of this type, we need a declaration of consent from you. being processed for the use of the app. I am aware that I may at any time revoke my consent with immediate effect. Compatibility with other Android™ devices possible, but not guaranteed. I transferred my data to the wrong account. You can manually delete any incorrect values in the table view. Then switch to the correct account and restart the transfer. Activate Bluetooth® on your smartphone and launch the "HealthForYou" app. You can add your "HealthForYou" device in the menu under "My devices". To do so, follow the instructions in the app. You are then taken to the screen for the respective category to carry out the initial synchronisation. Your activity sensor is permanently linked to your smartphone, and it synchronises automatically when the app is running in the foreground. How do I start transferring the measured values via Bluetooth®? To integrate your "HealthForYou" device for the first time, follow the instructions for your device in the app in the menu under "My devices". No data has been transferred from my "HealthForYou" device. Select the "My devices" menu item in the "HealthForYou" app. Remove your device at the bottom using "Remove device". Now add your device again and start the data synchronisation. The data transfer to the smartphone does not work. Check that your smartphone/tablet is compatible with the "HealthForYou" app. A list of all compatible mobile devices can be found under "Compatible devices". The activity sensor is in "sleep mode" (time displayed with crescent). To exit "sleep mode", press and hold the button for 3 seconds. The battery in the activity sensor is depleted. If the activity sensor does not switch on or only shows a battery symbol, charge it with the USB charging cable supplied. Check that you are using the correct app. Data transfer is only possible with the HealthForYou app. Is only the last measured value transferred to the app? No, all values from all user memories are always transferred to the app. Are the measured values deleted from the device after the data is transferred? No, the data is not deleted after transfer. It is chronologically overwritten when there is no more free memory space. The values can also be manually deleted from the device. Can several people use the app? You can create several users in the app. However, each user needs to register in order to distinguish the accounts. You can assign different devices or user memories to the various users in the settings. Do I need a "HealthForYou" device to be able to use the app? You do not necessarily need a device to be able to use the "HealthForYou" app. You can enter your measured values manually. However, using the devices improves precision, and it is easier to enter your values via the data transfer. Google requires access to the location from Android 6.0, as soon as the use of Bluetooth® is required. The location information is not used by the "HealthForYou" app, nor is it forwarded to third parties. Why do I obtain different values with a forehead or ear thermometer than with a traditional pen-type thermometer? Temperatures measured with different thermometers cannot be compared with one another. You should therefore tell your doctor (or bear in mind if you are diagnosing yourself) what thermometer you used to take your body temperature and in what location. Which factors influence body temperature? 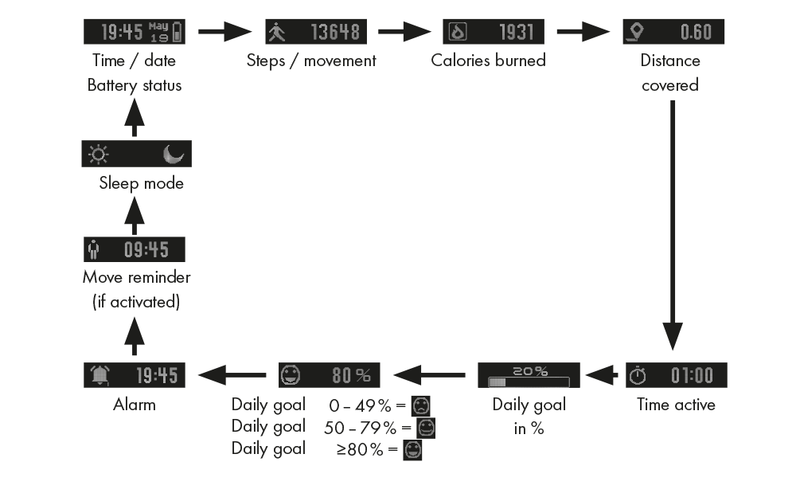 What functions are provided on my activity sensor and how can I configure them? The AS 80 can also display notifications about calls and messages. Why does my sleep evaluation show phases of being awake even though I was asleep? You do not notice the movements you make whilst you are asleep. The various phases until you are awake are determined by the movements you make in your sleep. It is therefore possible for an awake phase to be incorrectly determined whilst you are sleeping. Can I add another user to the scale? Yes, you can create several users on a smartphone using the "HealthForYou" app. Add the same scale in the profile settings for the new user. The scale saves the new user in the next available user memory once the user has been assigned. My scale does not recognize me. How can I assign the value to my user? Select "My devices" > "SBF 75" in the menu. Here, you can choose to assign the unknown measurements to the active user or delete them. Why is the data transfer from the scale to the app not working? Ensure that your smartphone is in the Bluetooth range of the scale and that the batteries of the scale are not empty. Close the app completely. When you re-open the app, wait a moment until the data connection is established. If this is not successful, please restart your smartphone.